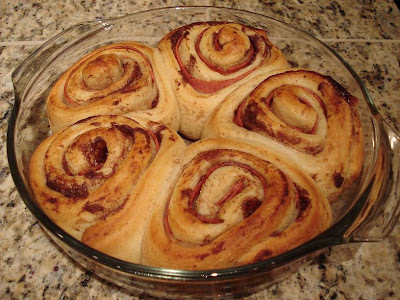 My latest cooksperiment is putting into practice a recent link I posted: bacon cinnamon rolls. They're easy to make, and incredibly tasty. 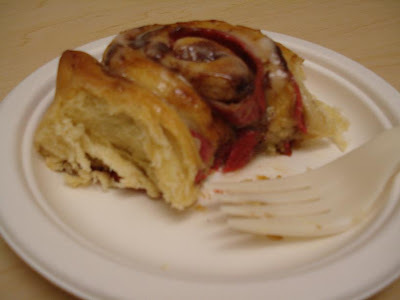 All you need is some bacon (or, in my case, fake bacon) and a cannister of cinnamon rolls. 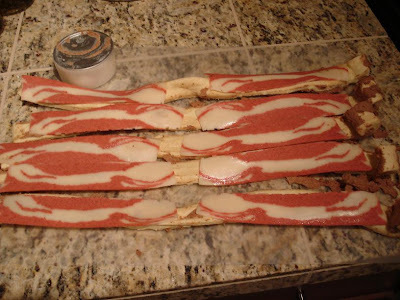 Separate the rolls, unroll them, and apply bacon strips to the "inside" of the rolls. Roll them back up and place in an appropriate baking receptacle. 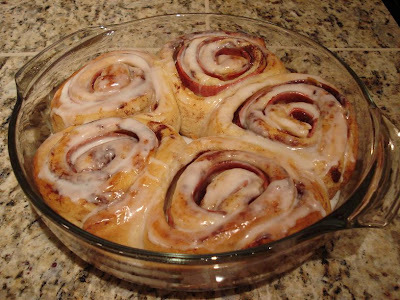 Top 'em with the (included) frosting. Not wishing them on my waistline, I took them to work. Apparently, they were a big hit, although it was hard to tell with all the buzzsaw noises. If you use real bacon, make sure you cook it first. Not too much that it's stiff; just enough to be cooked yet still flexible so you can roll it up. 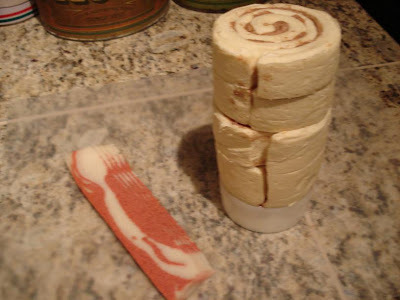 When you unroll the rolls, the "cinnamon" goo-filling gets on whatever you unroll them on. So be prepared to scrape it off and smear it back on the rolls. Don't worry if you don't get the unrolled rolls all rolled up tight again. The gaps allow the icing to penetrate the rolls, filling them with extra awesome. Enjoy! And let us know if you try 'em yourself! You need to cook the bacon first. Not so long that it's crunchy; you still want to be able to roll it up. A friend that made them said, "I wasn't prepared for the amount of grease." He literally had to pour out the bacon fat after taking them out of the oven. Which tends to make the rolls a bit soggy. The above friend decided that the taste difference isn't that great, so he'd go with the "facon" from now on just because it's faster and easier. You are crazy. 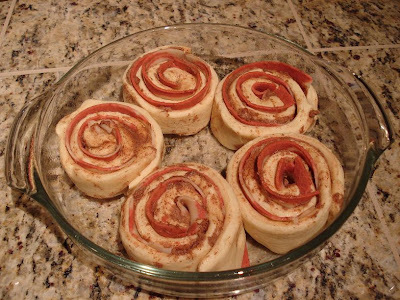 Jello brains, bacon cinnamon rolls. When I'm old and grey and kicking people off my very own lawn, I'll remember that I was there on 11/4/08. I saw progress, and I saw the culmination of collective hope. 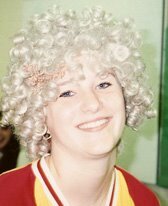 I was inspired and delighted. And I will totally make these on my own some time, because they were awesome. Facon and all. Two thumbs way up. And really, don't front. You know your bacon is all up in your syrup at the pancake breakfast. Try it. You'll be glad. Yup. I'm with Kent. And in fact, was there with Kent and tried them. Wonderful! I have the ingredients (real bacon, though) waiting for me in my fridge at home. I'm waiting to strike, like a snake waiting like a jungle cat, coiled like a spring, ready to strike. Or something. Wouldn't real bacon make them greasy? Hmm ... would it matter? Im sorry it looks disgusting. I am sad for the 2009 generation who called this epicness disgusting!!!!!! I just stumbled onto this with Stumble Upon and I was SO excited to see stripples! 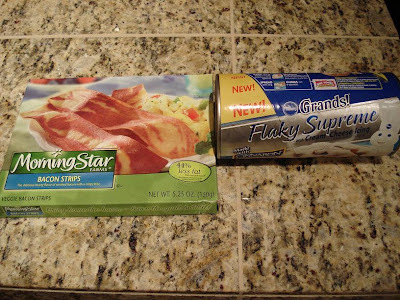 I'm vegetarian and I eat a lot of the Morningstar products. Love them! I'm making these tonight. Huzzah! Will the No! No! be a Yes Yes?